DIVE INTO THE HEART OF THE MEDINA AND AUTHENTIC MOROCCO IN A RIAD COMBINING TRADITION AND MODERNITY. From the moment you walk through the doors of La Maison Maure you are transported to a calm and tranquil haven. La Maison Maure is ideally located in the heart of the ancient city of Fez (Medina), just 30 minutes drive from the airport and 3 minutes from the Ain Azeleten port. It’s convenient location is an ideal base for discovering the history and magic of the ancient city including the madrasahs, fondouks, fountains, gardens, walls, ramparts and fortified gates. The 750 sqm property exudes elegance and refinement befitting a luxury establishment, both in terms of architecture and attentive service. 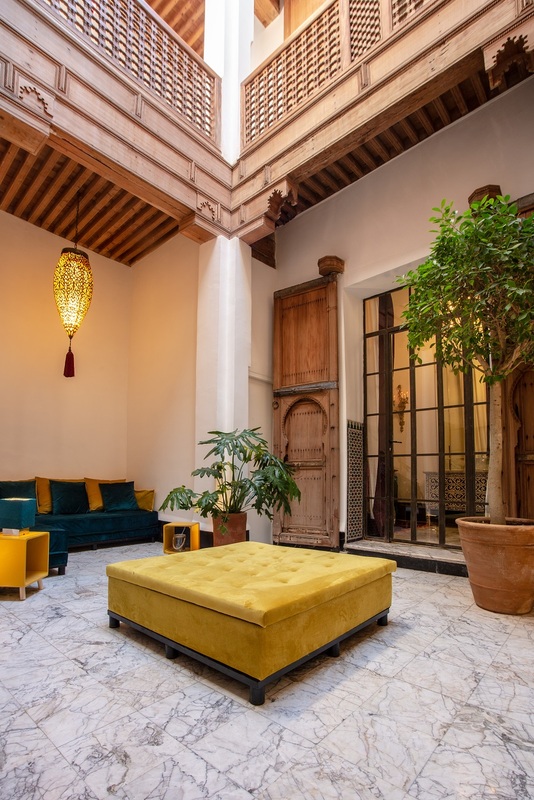 An ancient property of a Moroccan pasha dating from the 16th century, La Maison Maure was completely renovated by its current owner who is passionate about art and history. After 3 years of work and patience, the latter was able to restore this old residence tastefully, based on the finest materials and giving it a contemporary design while preserving its traditional lines and mosaics. La Maison Maure is equipped with furniture from the 18th and 19th centuries and its walls are adorned with original art, collected by the owner from his own travels abroad. You’ll feel like you’re in a different world the moment you arrive at La Maison Maure. Consisting of 6 bedrooms (1 deluxe suite with patio, 3 suites and 2 guest rooms), 3 terraces and 1 solarium (250sqm in total), this unique Riad offers panoramic and breathtaking views of the Medina, ideal for enjoying breakfast under the Moroccan sun and making the most of the sunshine. Also at your disposal are several lounge rooms, one with a fireplace. All these elements combined make La Maison Maure an elegant and luxurious destination. Its traditional Moroccan architecture lends it a unique refinement while still featuring all the desired modern comforts. Our multilingual staff are ready to welcome you, guide you and take care of you to make your stay truly unforgettable! We guarantee the best price if you book with us directly.